Fort Grant, now a prison, was originally a United States Army Cavalry Post. 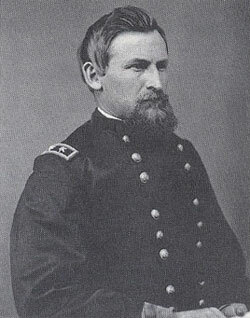 Because of unhealthy living conditions at Old Camp Grant, General Crook relocated the post some 45 miles northeast of the old camp at the foot of towering Mount Graham. On December 19, 1872, Fort Grant was established at the foot of Mount Graham by the direction of General Crook. In January of 1873, eleven companies of cavalry and infantry were transferred to Fort Grant, under the command of Major Brown. They immediately started work on the construction of a commissary building, officers' quarters and a wagon road up the side of Mount Graham. Troops patrolled Southeast Arizona and Western New Mexico, chasing small marauding bands of Apache Indians and keeping the peace. Ft Grant was a hub of activity during the Apache Campaigns. It boasted a quartermaster store second to none. The building later called Brown's Folly was over 200 feet long and 40 feet wide. It was constructed of solid stone and is still in use. Troops from Fort Grant participated in the military campaign against Geronimo which ended with Geronimo's surrender in August of 1886. In 1888, the Buffalo Soldiers of the 10th Cavalry were used in civil duties and for chasing train robbers. On May 11, 1889, Paymaster Major Wham was robbed of $29,000 in gold and silver coins while en route to pay the soldiers at Fort Thomas and Fort Apache. Starting in 1900, Fort Grant was a collection point for troops going to the Philippines during the Spanish American War. On October 4, 1905, Captain Jenkins marched Troop D across the parade grounds for the final time. The troops were transferred to Fort Huachuca and Fort Grant was left to a caretaker. In 1912, the federal government turned over Fort Grant to the new state to be used as the State Industrial School for Wayward Boys and Girls. Ft Grant had a taste of delinquency long before the State Industrial School was moved there. William H. Bonney (aka Billy the Kid) allegedly killed a man at this frontier outpost in a fight. In 1968, the Arizona State Legislature passed a bill making the Fort Grant State Industrial School a part of the State's Department of Corrections. In 1973, Fort Grant became an adult male prison. In December of 1997, the Arizona State Prison at Fort Grant became the Fort Grant Unit of the Arizona State Prison Complex Safford (ASPC-Safford).